Cancer is the leading cause of death worldwide. It accounted for 7.9 million deaths (around 13% of all deaths) in 2009. Deaths from cancer are projected to continue rising, with an estimated 12 million deaths in 2030. This calls for more awareness targeted towards reducing the prevalence of this disease. Eat plenty of vegetables and fruits everyday. Women should self-examine their breasts every month and report any suspicious lump to the doctor. They should also get a pap smear done, on a doctors' advice. Men should get a PSA (prostate specific antigen) test done, especially if they have a family history of prostate cancer. Keep yourself clean to reduce the chances of infection. Do not consume alcohol and grilled meat, excessively. Do not use salt and high-sodium foods in large quantities. Do not eat foods which have mold on them. Do not smoke and if you do, quit at the earliest. Do not share syringes for injections. Do not spend too much time in highly polluted areas. If your work requires you to do so, always ensure you wear a smoke mask. Lycopene-rich foods such as tomato and watermelon reduce the risk of prostate cancer. Beta carotene-rich foods such as carrot, mango, and pumpkin support the immune system. Oranges, limes, and grapefruits contain flavonoids that inhibit tumor cell growth. Spinach, pulses, and legumes are rich in folate that helps in the building of healthy cells. Indoles in cabbage and cauliflower eliminate excess carcinogens. Anthocyanins found in blueberries and purple grapes destroy free radicals. Resveratrol present in berries decreases estrogen production. 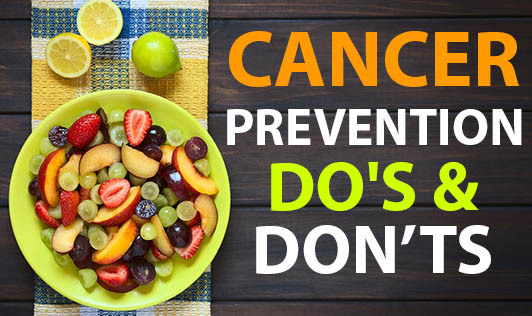 Fibre from whole grains, vegetables, and fruits helps in carcinogen removal.